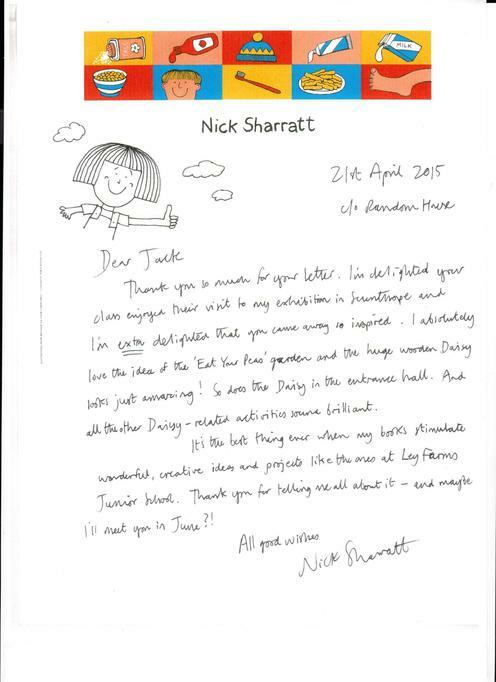 Jack (Year 6 Class AL) wrote to the famous children's author and illustrator, Nick Sharratt, just before Easter, telling him about the class visit to the exhibition at 20/21. He also told him about all the creative work which has come from the visit throughout the school and sent photographs of the "Daisy Garden" and the model Daisy in our entrance. We are impressed that Nick took the trouble to hand write a personal letter to express his delight that his work is stimulating children. A scan of his letter is here.